Introduced in 2002, the V-Strom 1000 expanded the popularity of motorcycles in the adventure-category. When a more proficient V-Strom 1000 debuted in 2014, it was also embraced by riders around the world. To reemphasize the V-Strom’s leadership in this category, Suzuki applies new technology and practical experience to the new 2019 V-Strom 1000. Always a good citizen, this new V-Strom has refined systems to maintain engine performance and great fuel economy while achieving world-wide emission standards. 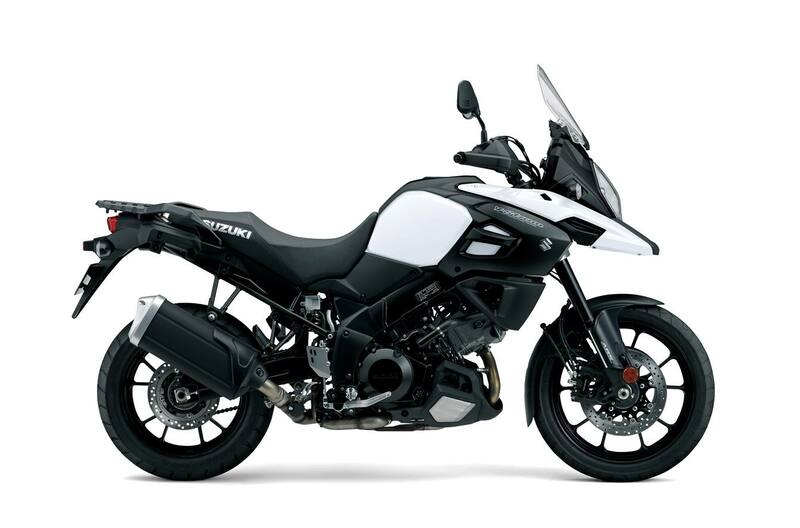 To emphasize Suzuki’s adventure heritage the V-Strom’s exterior has undergone a transformation giving the motorcycle a hint of its lineage and a renewed call for adventure. That fresh styling also contributes to functionality and joins the new Motion Track Anti-lock* & Combined Brake System and other features to bring rider assist technology to a new group of adventure riders. Like every V-Strom before it, the appeal and value of the 2019 V-Strom 1000 will be recognized by experienced and enthusiastic riders. If you want to enjoy a trouble-free adventure as well, join them on a V-Strom. 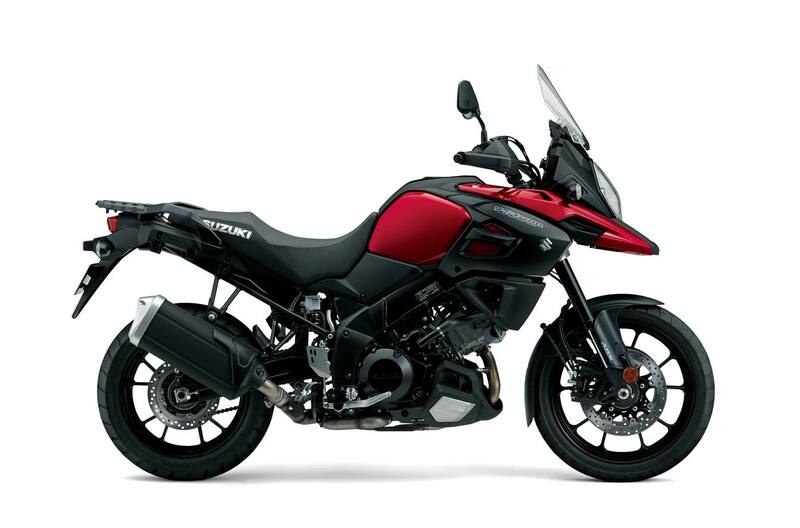 The V-Strom 1000 ABS builds on the comfort, flexibility and performance the V-Strom name offers. Standard equipped with : cast aluminum wheels, hand guards and an under cowl * The Traction Control System is not a substitute for the rider’s throttle control. It cannot prevent loss of traction due to excessive speed when the rider enters a turn and/or applies the brakes. Neither can it prevent the front wheel from losing grip. * The ABS is a supplemental device for brake operation, not a device for shortening stopping distance. Always remember to reduce speed sufficiently before approaching curves. Sturdy chassis has integrated mounting points for unified Suzuki V-Strom luggage that's is easy to clip on and off, and keeps the motorcycle trim when ready for touring. The V-Strom's Anti-lock Brake System (ABS)* has been updated with Suzuki's new Motion Track & Combination Brake System. This system aids rider control during sudden braking, even in corners, and will help the rider continue cornering on the originally intended line. Information about the motorcycle's attitude is continually measured by a BOSCH five-axis IMU. Sensors on the front and rear wheels continually measure speed. The wheel speed and IMU measurements, plus the amount of brake lever or pedal pressure, are calculated by the ABS control unit to instantly adjust the fluid pressure to the brake calipers as required. The rider has independent control of the front and rear brakes unless a situation occurs to activate the Anti-lock or combination braking features. Suzuki's debuted its first motorcycle traction control system** on the V-Strom 1000 ABS, which enables the rider to control the throttle with more confidence in a variety of riding conditions. *The traction control system is not a substitute for the rider's throttle control. It cannot prevent loss of traction due to excessive speed when the rider enters a turn and/or applies the brakes. Traction control cannot prevent the front wheel from losing grip. The height- and angle-adjustable windscreen has a new shape and is 49mm taller. The windscreen was developed through extensive wind-tunnel testing to reduce wind noise and rider fatigue. Suzuki's patented mechanism allows the windscreen angle to be easily adjusted by hand. The V-Strom's slender chassis, thanks to the narrow V-twin engine design and new thin seat, helps the rider's legs to reach to the ground easier than other models in the class. Optional : A wide variety of Genuine Suzuki Accessories for V-Strom owners are available including luggage, heated grips, auxiliary lights, high and low profile seats, case guards, and a large selection of Suzuki logo apparel. Additional lock tumblers that match the bike's ignition key are included so you can add Suzuki accessory luggage and have the convenience of one-key operation. * The Traction Control System is not a substitute for the rider's throttle control. It cannot prevent loss of traction due to excessive speed when the rider enters a turn and/or applies the brakes. Neither can it prevent the front wheel from losing grip.